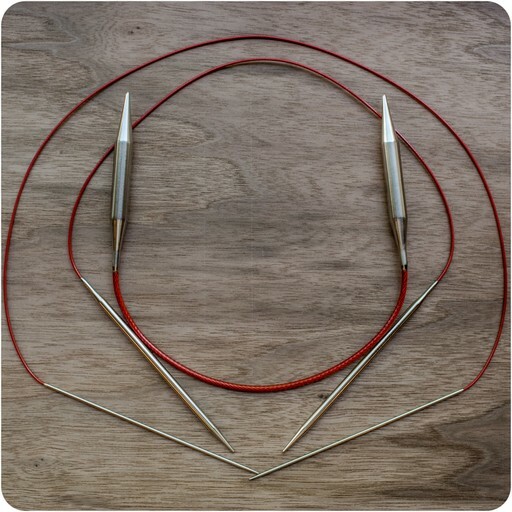 ChiaoGoo RED Lace circular knitting needles are made from premium stainless steel with a multi-strand, nylon-coated steel cable. The cable is very smooth and flexible with no memory. That means no dunking it in hot water to straighten the cables out! The tips on these circulars are very pointy -- comparable to the $40 Signature Stiletto's. The joins are as smooth as a Cadillac. Laceweight and cobweb yarns slide over the join with ease. The needles themselves are not as slippery as Addi needles, nor as grippy as wood or bamboo. They're a happy medium of not-too-slick and not-too-grippy. Note: The 16 inch circular is not manufactured in a US-17 or US-19. All circular lengths are measured from tip to tip.